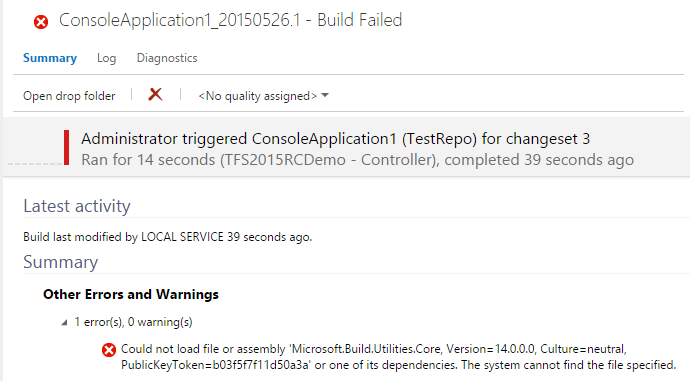 XAML Build fails in TFS 2015 RC: Could not load file or assembly ‘Microsoft.Build.Utilities.Core, Version=14.0.0.0, Culture=neutral, PublicKeyToken=b03f5f7f11d50a3a’ or one of its dependencies. Mucking around TFX2015RC throws up some surprises. 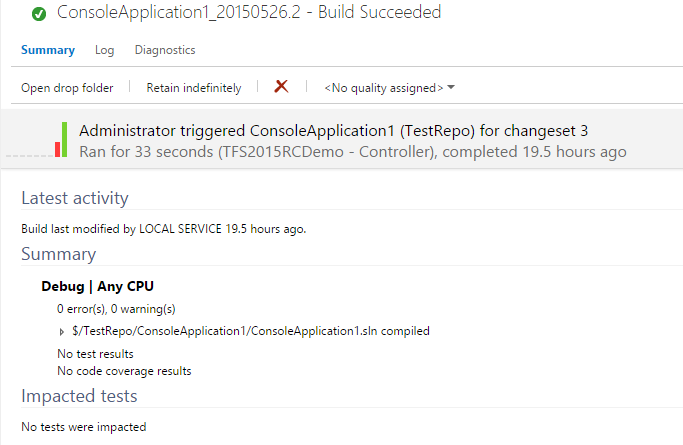 Creating a new build XAML build definition / loading an old XAML definition will result in a cryptic build error. The current fix? Install VS2015RC on the box – minimum installation options should suffice (unless you encounter that weird installation bug that prevents you from doing that). Hope that Microsoft packages that DLL into TFS directly, rather than required an entire install. Microsoft, are you seeing this??? [1E58:06CC][2015-05-26T15:07:39]e000: Error 0x80070005: Failed to open WU service. [1E58:06CC][2015-05-26T15:07:39]e000: Error 0x80070005: Failed to ensure WU service was enabled to install MSU package. [1E58:06CC][2015-05-26T15:07:39]e000: Error 0x80070005: Failed to execute MSU package. [091C:14C8][2015-05-26T15:07:39]e000: Error 0x80070005: Failed to configure per-machine MSU package.